Being able to speak well in public is not just an essential skill for aspiring TEDx talkers, it’s a huge asset for any ambitious professional. Even the most accomplished orator will admit to getting butterflies, or even feelings of nausea, before going on stage. So why are so many of us afraid of standing up and saying our piece? Let’s take a look at the science of anxiety. Believe it or not, anxiety is actually a good thing. Fear and anxiety occur in response to a potentially threatening stimulus. When confronted with a threat, our bodies prepare for battle. Blood pressure and heart rate go up, while blood flow to the major muscle groups is increased. Incredibly useful when faced with a hungry tiger. Not particularly helpful when presenting to the board. A room full of suits looks a lot different to a salivating predator, so why do we perceive public speaking as a threatening situation? Much of it has to do with the importance we place on these presentations. We fear these situations because we overestimate what is at stake. We view the oral presentation as a threat to our credibility, our image, even our career. Then there are also people who experience what researchers call anxiety sensitivity, or “distress intolerance”. Essentially, this is the fear of fear, or the fear of experiencing unpleasant emotions. Anxiety sensitivity means that, in addition to fearing speaking in public, you’re also worrying about experiencing anxiety about it. Not only that, but how that anxiety will impact your ability to perform in challenging communication situations. These sorts of high-stress levels can be extremely damaging to our mental and physical health. They’re also counterproductive to ambitious professionals who want to progress their careers. Essential to advancement is the ability to manage your stress so you can build resilience, perform at your best and speak confidently in any situation. Self-consciousness and anxiety indicate that our attention is misplaced. We’re fearing for ourselves, for our safety. This is how we’re hard-wired. But it’s important to remember that presentations are not about you, they’re about the audience. Try to divert your attention to considering what your audience needs. What can you give them? As a public speaker, you can turn “nervous into service” by, positioning yourself in your own mind as a facilitator of their wellbeing — instead of someone with a target on your back. Look at your audience, gesture towards them, include them in your monologue as though it were a dialogue. You’re there for their benefit, not your own punishment. It’s a common exercise in acting, to use your body in order to get you into a certain frame of mind. For example, if you’re playing the part of someone very anxious and fearful, you tense your shoulders, frown and dart your eyes around the room. If you’re playing the part of someone bold and fearless, you stand tall, lift your chin, relax your face and shoulders. However, beware thinking of public speaking as a performance per se. 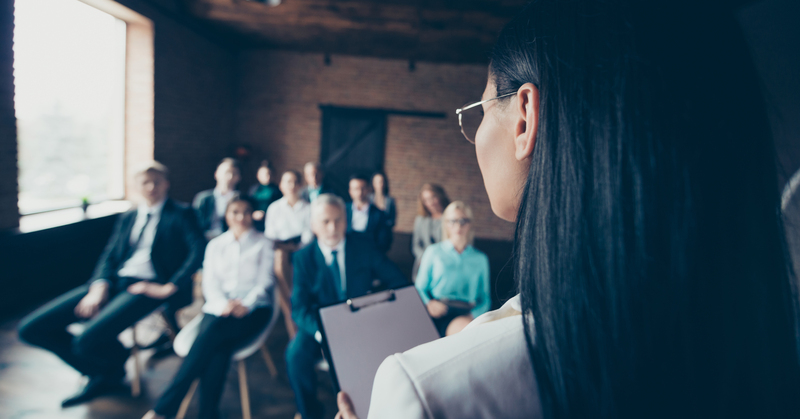 This is called “performance orientation.” It means you view your role as a speaker, and you see the role of the audience as judges who are evaluating how good your presentation skills are. In contrast, “communication orientation” means that your main focus is on expressing yourself. The objective is simply to get your message across to the audience, just as it is in everyday conversations. Yes, you should act confident. But it needs to be a confident version of who you really are, not another person. Use words that you’re comfortable using. Ditch over-complicated terminology, buzzwords and meaningless “corporate speak”. You wouldn’t use that language to talk to your friends, so why use it on your colleagues? Choose to enjoy the experience. And treat it as exactly that — an experience. Smile. Take a deep breath. Pause. Look up. Who’s there? Remember this moment. Make the most of it. Marvel at the opportunities and challenges life throws at you. Not just at you but at all of us, including everyone in the audience. Try to find the common ground. Ask yourself, why are these people here to listen to me? Find the reason and trust that you’re the right person to be talking about it. A major factor in the fear of public speaking is how skilled you are at it. While many people consider themselves to have a natural talent in this area, there is always room for improvement. Those that work developing their skills, are generally the best speakers. So, to take control of your public speaking, join our Mastering Communication training program today, which is specifically tailored to professionals who want to improve their skills in this area.